The centerbore of a wheel is the size of the machined hole on the back of the wheel that centers the wheel properly on the hub of the car. The wheel would first be precisely positioned, and then machined to the exact size required. We have a process that allows us to machine a five hole PCD to a four or four to five etc…. We do this without the use of welding, which would normal distort a wheel. This only works in some cases, mostly when a wheel has a cap, which covers the PCD Holes. This process also eliminates the use of PCD ADAPTERS. The Wheel offset is taken from the wheels centre line and measured to the mounting face of the alloy wheel. There are two main offsets Positive and negative, We can create both, either Increasing or reducing the offset using our CNC Machines. Using our CNC machines we can Skim 5mm off most pre-drilled wheels, (ie. ET35 to ET40). Blank wheels can be machined to almost any offset. 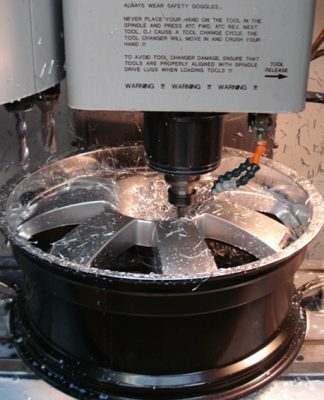 Using our CNC machines we can change the spec of most pre-drilled wheels, with or without a cap covering the holes. The PRE-DRILLED wheel would first be precisely positioned, and then the first hole of the PCD would be located. Then machined to the exact size required. But any PCD Fitment is possible if the wheels have the same amount of holes within the pcd. 5/100 TO 5/98, 4/108 TO 4/114.3 ETC……….